Review The 13in MacBook Pro I reviewed last week is a machine for folk who fancy a carry-around computer but who want a bit more welly than the way more portable 13in MacBook Air can provide. The 15in version, on the other hand, is a desktop replacement for the power hungry. Sure, it's mobile. It has a decent battery life. But it's not a computer to keep with you at all times. Performance is its virtue, not portability. And what performance. Like the 13in MBP, the new 15-incher is built around Intel's second-generation Core i processors, this time all four-core, eight-thread boys. As you'll see from the benchmark results on the following pages, it makes a difference. 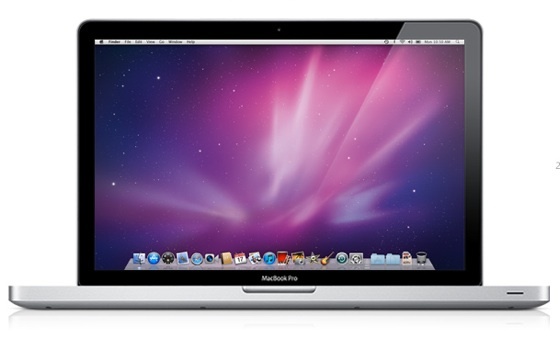 I took a spin with the 2GHz Core i7-2635QM-based version, but Apple also offers a model with a 2.2GHz quad-core chip. The latter is £300 more expensive, but you get an extra 250GB of hard drive storage - 750GB to the lesser model's 500GB - double the dedicated video memory - 1GB of it - and a more upscale AMD GPU, the Radeon HD 6750M. The cheaper of the two 15in MBPs has the Radeon HD 6490M with 512MB of GDDR 5. Both version also have an integrated Intel graphics core clocked at 650MHz but capable of being overclocked to 1.2GHz here. It's built right into the CPU, and Mac OS X switches between the two graphics cores - Intel to keep the power consumption as low as possible, AMD when your app needs some visual performance - dynamically and entirely invisibly. I have a previous-generation 15in MBP and use Cody Krieger's excellent free, open source utility gfxCardStatus to control which GPU my machine - which has a mix of Intel and Nvidia graphics - to set which is in play. Cody has just updated his app to support the new MBP's AMD chippery. If you get one of these machines, his app is a must-have download.